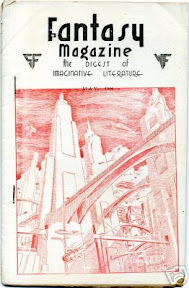 Science Fiction and Fantasy Reading Experience: Ultra-Rare Serials from "Fantasy Magazine"
It took some time to get information on these, as these super-rare issues are not cataloged on the web, and these stories are absent from all available bibliographical sources! 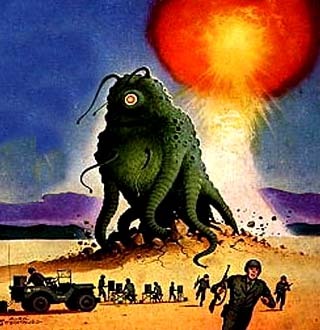 The incredible line-up of writers, Lovecraft writing side-by-side with Howard, Smith/Campbell/Hamilton are all doing what they do best (blowing up planets) - together! Smashing "wonder-fiction", crying to be brought into the spotlight again. "Let us contemplate with melding hearts and soaring minds the infinity of beckoning stars"
- Richard Vaughan, "Exile of the Skies"
Unreal... 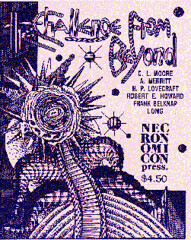 Simply the most unique event in the history of science fiction, a collaboration of the brightest stars in the field, some at the beginning of their careers, some already at the peak. The list of writers is a shining "all-star" galaxy in itself. 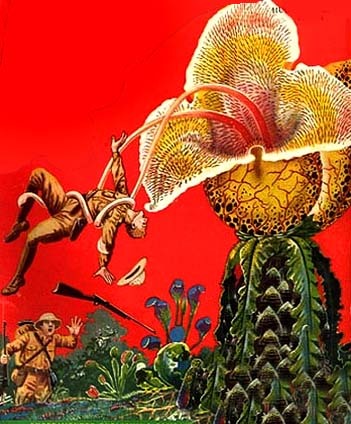 The fiction is... well, it's big-scale, full of grand conflict, ridiculous science, unpronounceable names and places, more bang that you ever encountered between soft book covers - testing the limits of reader's imagination and credulity. 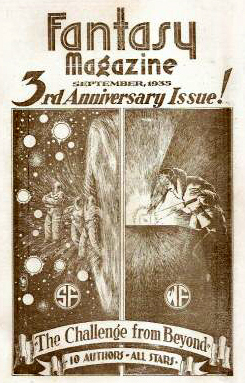 Impossibly hard to find today, the serial spanned the issues of "Science Fiction Digest", and then "Fantasy Magazine" (the installments of the Cosmos round-robin were not printed in the issues themselves but as separately-bound supplements). Personally I liked the "Last Poet" part and the crazy, absolutely delirious space battle extravaganza by Lloyd Arthur Eshbach. Multi-dimensional "Wrongness of Space" anomaly attacks our system, alien menaces and mad scientists pop out of every wrinkle of time and space, flying around (some will say chaotically) in droves, driving the serial to its bang-up finish - incomparable Edmond Hamilton destroying the planets Pluto, Neptune, and Uranus with an atomic disintegrator ray in his "Armageddon in Space". 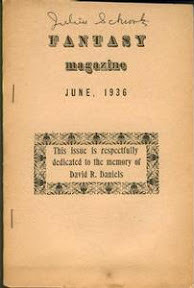 A monumental literary artifact from the "wonder pulps" era, quite enjoyable even to this day. The Ultimate SF&F Collectible! An extremely rare "round-robin" serial, published in the impossibly hard-to-get magazine (almost a fanzine) and only recently reprinted as a limited-edition chapbook. The similar SF round-robin serial "Cosmos" from "Fantasy Magazine" is also hard-to-find: it's been reprinted only in "Perry Rhodan" magazine, of all places! It's time for somebody to publish these serials together as one paperback... The best pulp writers at the time were asked to submit a story episode, and they all did - this tells you what an unpretentious and enthusiastic crowd they were - each keeping his or her own signature style, together making a sort of "Who's Who" catalogue of the fantastic pulps. So far I have only read a few episodes, but let me tell you, it's almost like coming to the most delicious smorgasbord of all times... vintage and delectable stuff all over. 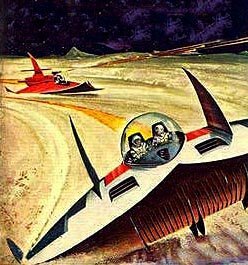 beautiful these golden olden science fiction magazines - there's a layer of time here that makes these old science fiction publications unique - like worrks of art have it. 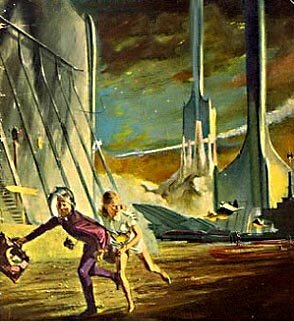 I prefer these old publications anytime over the new ones, although much that is good also happens today in science fiction. 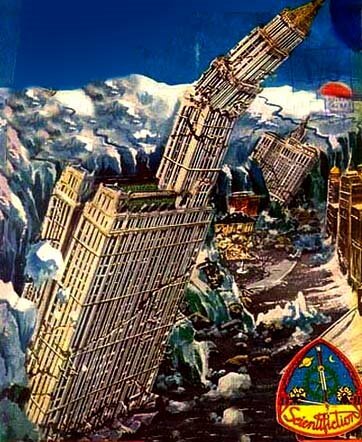 Theo, your site about Hollow Earth is quite fascinating; I will link to it - thank you for the great read! I have all of these issues, with the Cosmos inserts, and am working (slowly) to transcribe them. 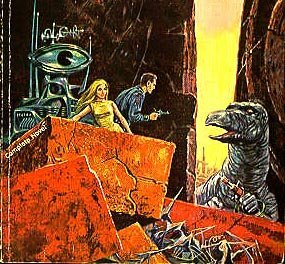 They were also re-published in the Perry Rhodan book series (Forry Ackerman). 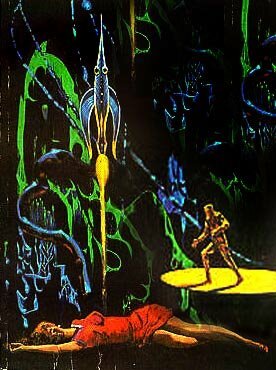 I remember reading parts of COSMOS when it was re-published in Perry Rhodan, but never got to read the complete story. Does anyone know where I can find a collected version of this Classic (with a captial "C") story? _nospam_onlyunwantedjunk@gmail.com Thanks! The **full text** of Cosmos is now online at cosmos-serial.com. Work continues to document the story of the novel on that site.